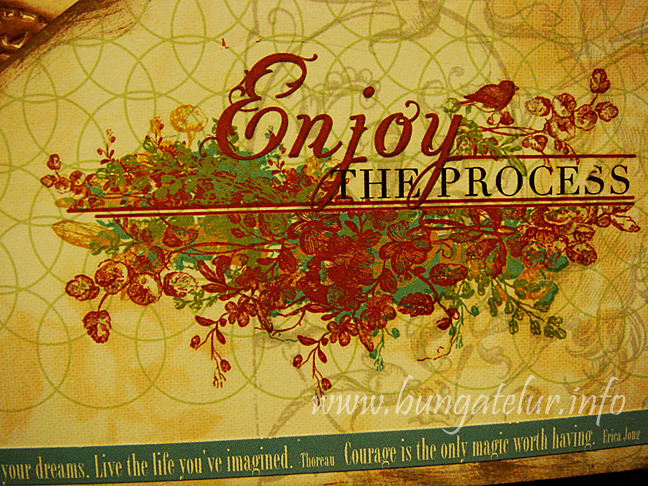 I almost didn’t make it for the challenge Scrap-it-Lah 2nd Anniversary Bloghop: Week 4 because my printer was out of inks..huhu! Luckily Dear Hubby has been so sweet to go to the nearest shop today (as on Wednesday) after work and bought me new inks. He even baby sit our son for a few hours so that I can get down and do the layout peacefully. And the best part is the new items I ordered from Simon Says Stamp 10 days ago have finally arrived. I bought Martha Stewart doily lace punch (which I have been eyeing for a while) and straight away tried the punch as you can see in the layout..hehe! I also bought Webster’s Pages 6 x 6 TRENDSETTER Petite Papers which some has been cut and used as a tag and a whole piece has been used on the right side of the layout. I should have bought their 12 x 12 papers as well so that I can fussy cut some of the beautiful roses. 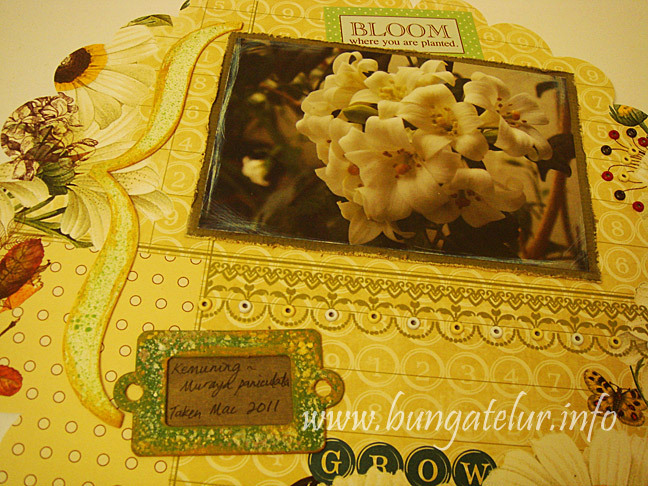 Oh, I managed to use few items from Jenni Bowlin range like the butterfly stamp, dye ink and her paint dabber in Malted Milk for this layout. The butterfly is stamped on a white cardstock in Cough Syrup ink. I put some glossy accents (which you can hardly see the effect in the picture) on the butterfly. Overall it is such a nice feeling to be able to incorporate all the new materials and tools I bought for this challenge. At least I don’t get to feel guilty for hoarding those stash for years to come..haha! 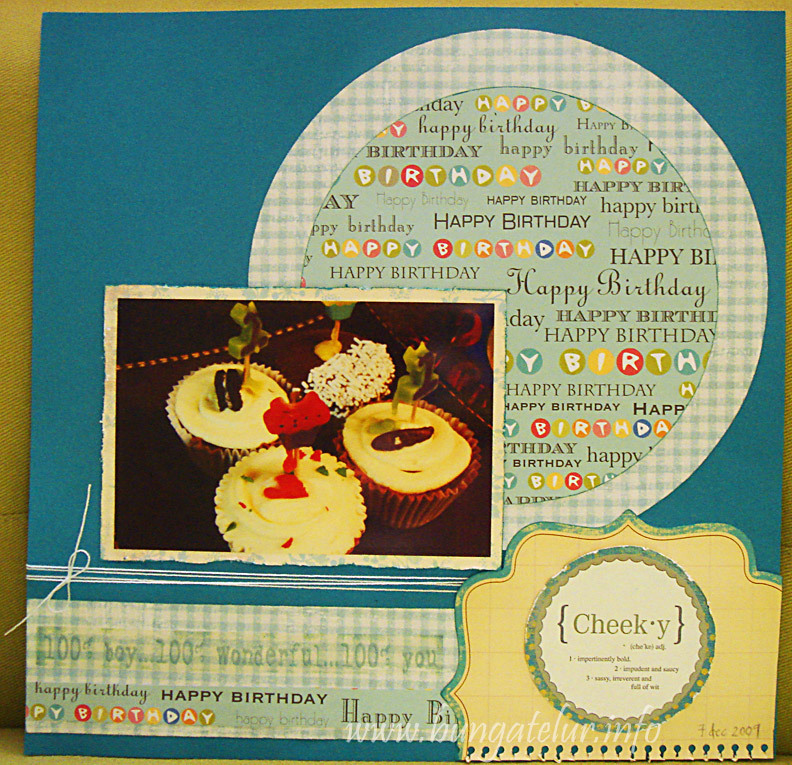 I am also entering this layout for Simon Says Stamp Challenge Blog 2nd Anniversary – anything goes. Who knows I might be one of the lucky entrants to get some more great goodies from their store..I wish!! Last week I was learning the correct technique on how to print out picture on 4R size photo paper. Sometimes using my simple way of cropping the picture in Photoshop and send them to printer doesn’t give the output that I want. After learning more about the Fixed Ratio style and resolution, I managed to print this picture of Murraya paniculata or Kemuning flowers. The challenge that I am up to this month is to use a minimum of 23 eyelets on the layout. 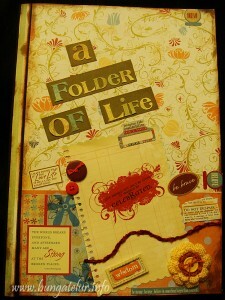 Check out Scrapbookers Anonymous April Challenge. I hardly use the bunch of eyelets I bought in 2006. Reason being I hate making holes for the eyelets to go through. I’m not sure whether there exists such updated tools that will make the task easier. I’m still using the ancient tool I have to make the holes..huhu! On the right side are the first 10 eyelets I put on the layout. 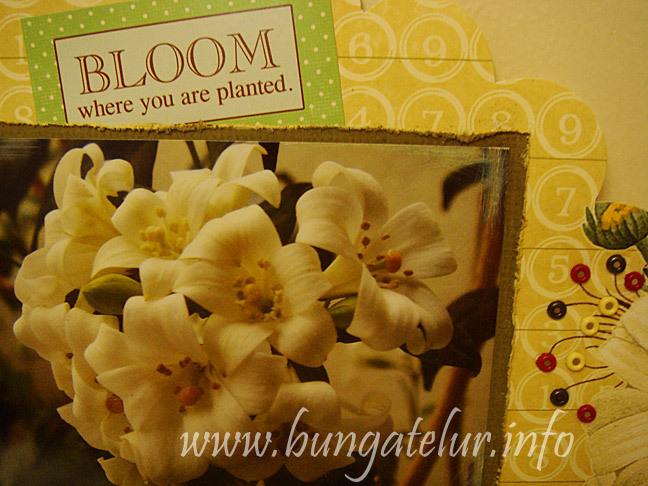 I also found a sentiment sticker that fits the gardening theme for this layout. Since I was using the Webster’s Pages Wonderfall diecut paper for this layout that is already beautiful, I tried not to embellish it too much. If there’s one thing I regret doing, it was sanding the edge of the picture in a dim lit room. Only when I snapped the picture I realized how too sanded the edge became…huhu! For the chipboard, I used acrylic paints. I misted some paint using wet brush on top of the chipboard and painted the edge in Antique Gold. Oh, check out the other 13 eyelets, what a wrist workout to make all the 23 holes..huhu! 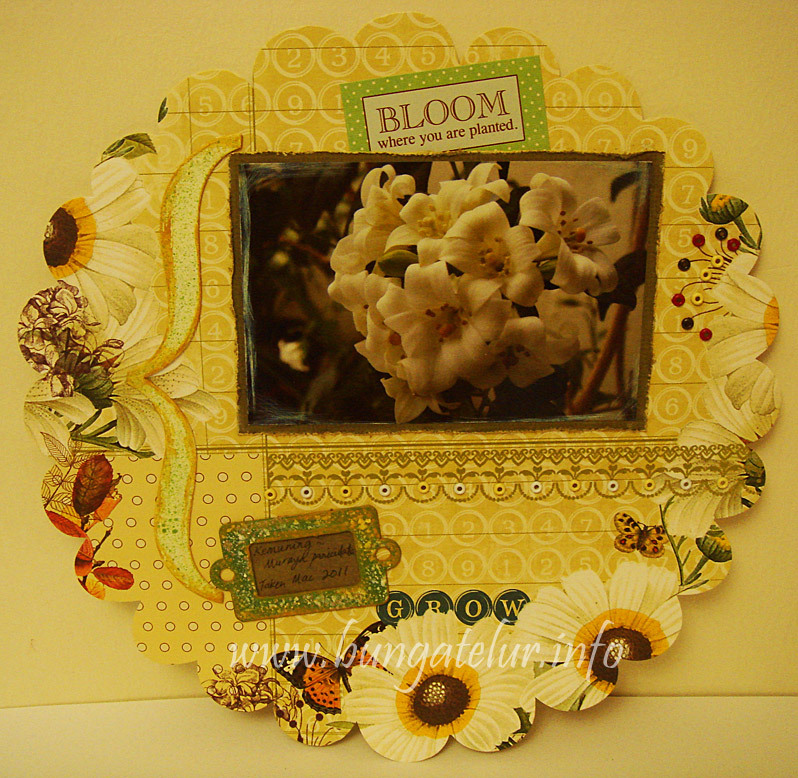 I am also entering this layout for Scraptivations April Challenge. I just found out about the challenge while reading Bec Miller’s blog. Thanks Bec for commenting! 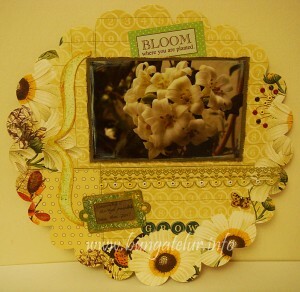 I think those combination of bright yellow, cream and green are just perfect for flower theme layout like mine. This is the first time I do anything crafty with door hanger. I’ve got one through decoupage gang gift exchange last year, but that one was using napkin. 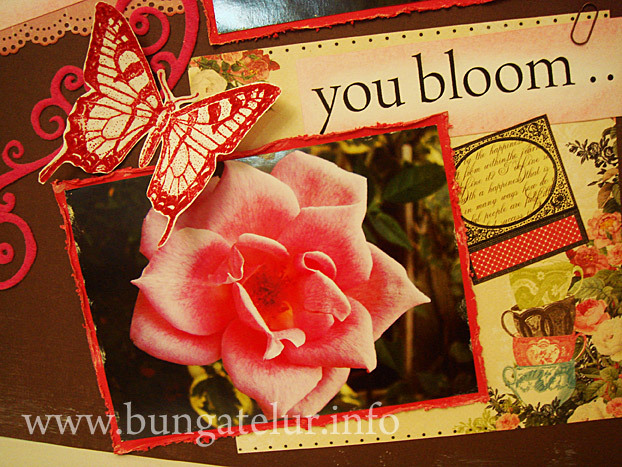 I thought for the 3rd Week Scrap-It-Lah challenge I will do something decoupage like but using patterned paper instead. 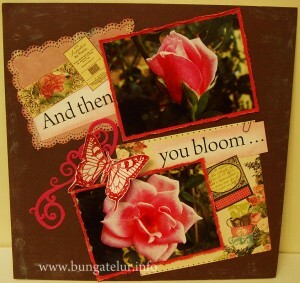 It is some rosy, shabby style pattern which I hardly use for scrapbook layout. 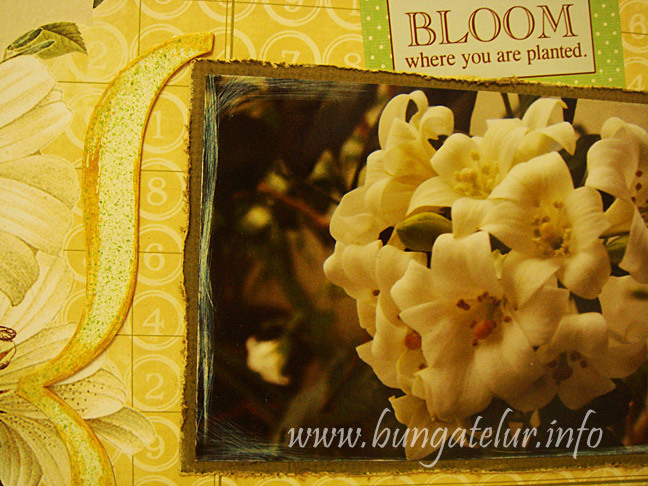 I fussy cut the main flower, glued it down and inked around the image so that it blends with the background. 90% of the materials used for this altered work are some old stuffs I bought like 4-5 years ago. Oh, I get to use the Making Memories sanding block I bought to sand the paper all around the door hanger. At first I used rub on from Bohemia line of My Mind’s Eye to embellish the background but it was too subtle as the background paper is dark maroon. I dug out some old Queen & Co felt self adhesive scroll in white and arranged them to fit the left part of the door hanger. I plan to stamp or use alphabet sticker to spell the name of the recipient on the top part of the hanger once I have decided who I will give this door hanger to. I’ve never done altered file using patterned papers before. 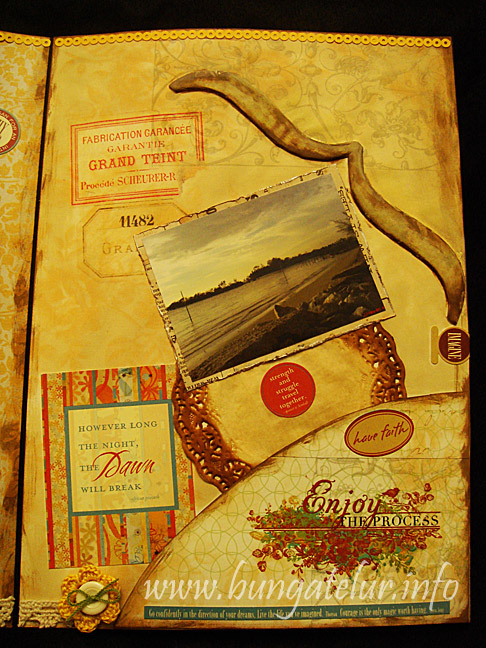 So this was my first attempt to use all the available scrapbooking stash. 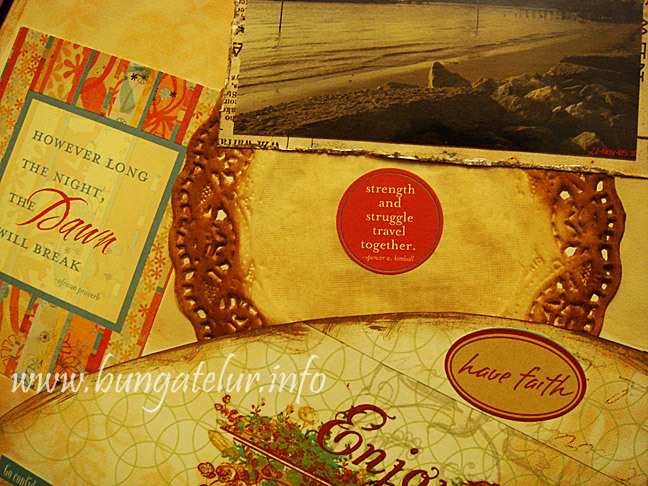 And I have never done anything with this kind of brown, yellow vintage theme. To tell the truth, I actually chose the theme because I wanted to use the motivational 7Gypsies sticker. 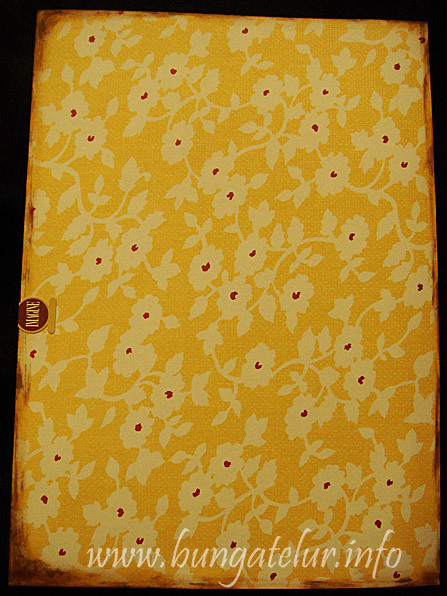 After matching every possible piece of patterned papers in my possession, only those yellowish, brown papers “speaks” to me. It is quite a challenge for me because I usually will go for bright colors in my layout. My favorite part would be the crochet flower with button. I crocheted the flower many months ago but couldn’t find any use for it. The yellow brown flower fits the theme perfectly. For the inside pages of the altered file folder, I used a lot of distressing. 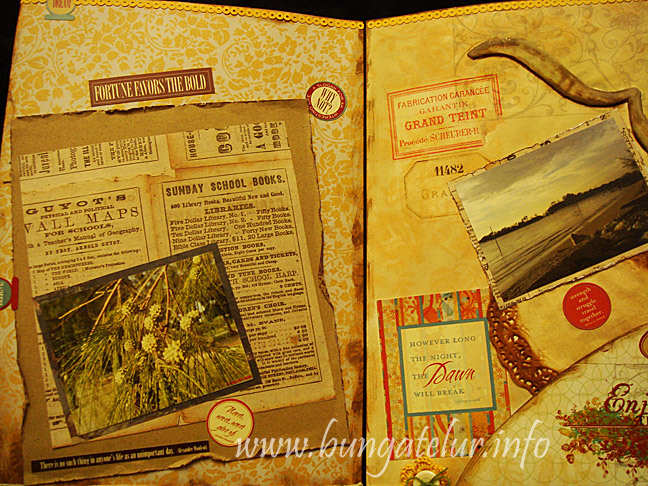 I used Vintage Photo, Antique Linen and Shabby Shutters distress inks. 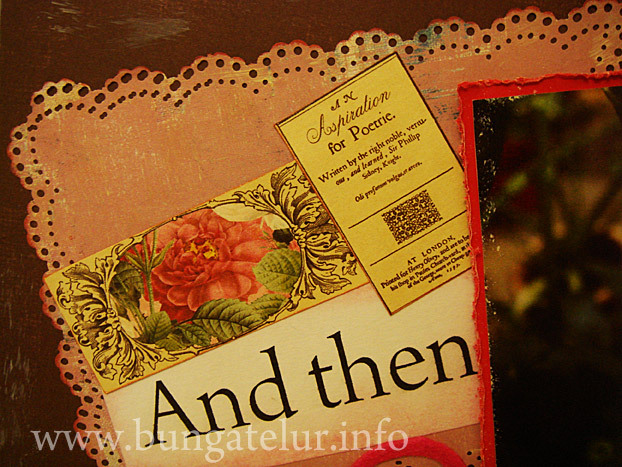 The picture mat and kraft paper were also distressed using the Tonic Paper Distresser. This green tree by the seaside photo was taken 6 years ago during the trip to our wedding anniversary seafood dinner. How time flies!! 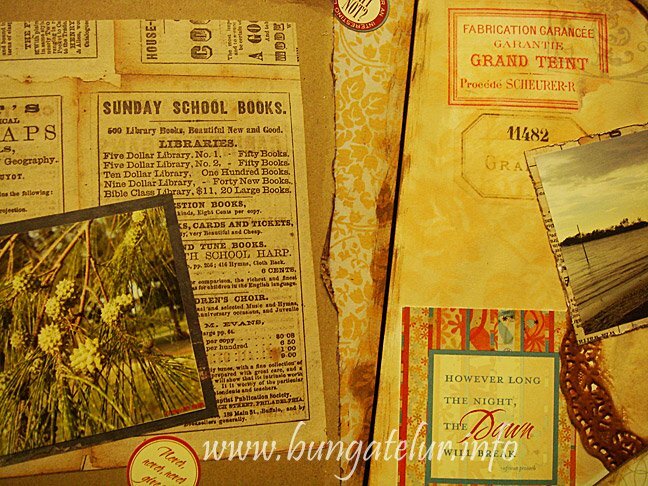 The chipboard bracket was covered with patterned paper and distressed with inks. 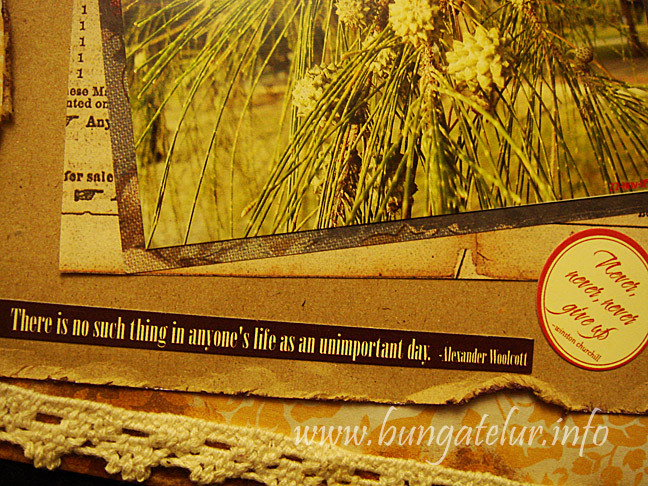 I also used Tim Holtz distress inks on the white doily to turn it into brown yellow color. I finally get to use this Rhonna Farrer rub ons I hoarded many, many years ago. 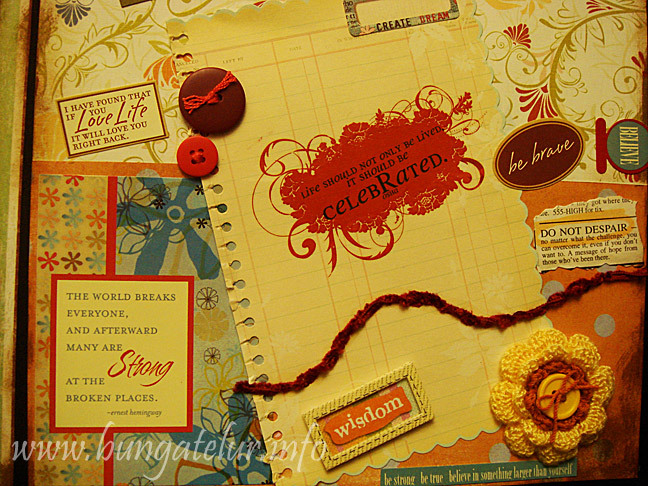 The sentiment and color is so beautiful that I feel so reluctant to use all of the rub ons in my previous creations..huhu! For the back of the file folder, I didn’t embellish anything. I just used the Jenni Bowlin patterned paper I got from winning the Papier challenge last year. Simon Says Stamp and Show Some Distressing challenge. I’m doing this birthday layout in order to take part in the Scrap-It-Lah Second Anniversary challenge. 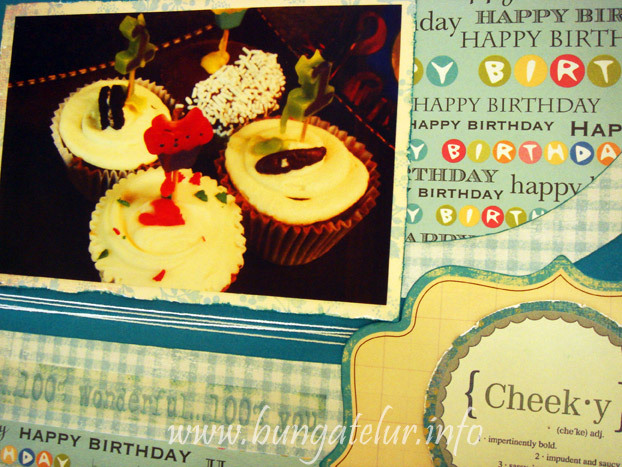 Their first blog hop is to Wati’s Creations. I really would love to share pictures of my precious son celebrating his birthday, but since I can’t due to privacy and safety issue, I decided to use the picture of cupcakes we bought for his first birthday. I tried to make it as masculine as possible for this layout, thus no usage of flowers or ribbon. 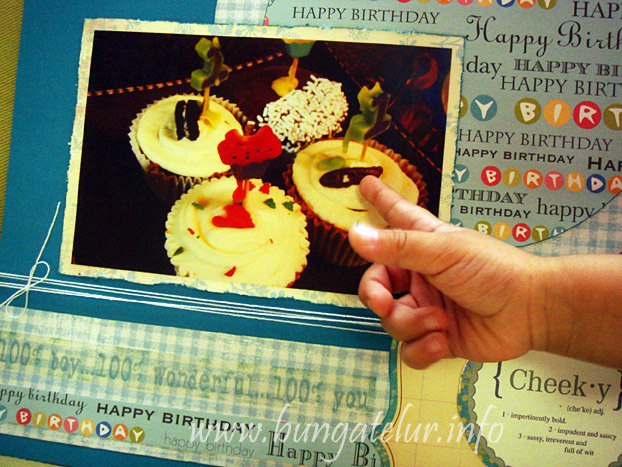 At first I wanted to print some journaling, but since I was short on time, I decided to use the sticker sentiment “cheeky’ to describe the whole first birthday experience. See the little fingers who just can’t sit still for a moment, always curious and driving Mama crazy every single day..huhu!